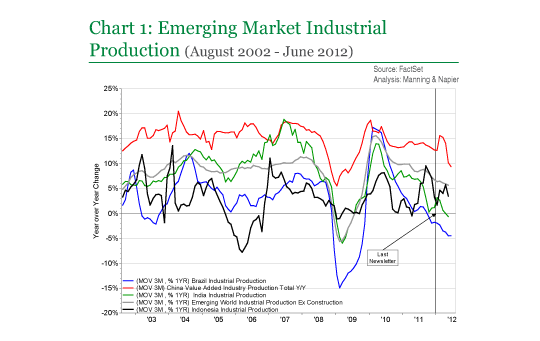 We concluded our December 2011 Outlook Series piece: Emerging Markets: Dipping a Toe In, acknowledging the extraordinary growth prospects in the emerging world, which were even more compelling in the midst of the slow growth environment. 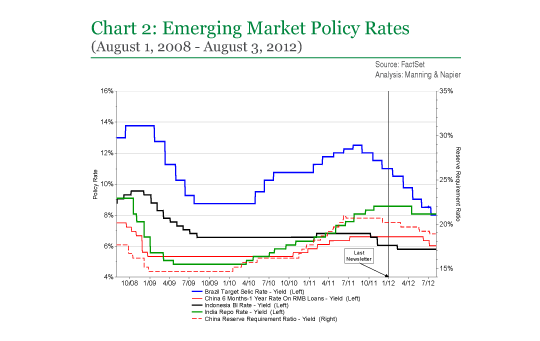 To recap, as conditions evolved throughout 2011, valuations and growth expectations for Emerging Market (EM) equities came in substantially, and we began seeing signs that monetary policy makers were shifting their focus away from controlling inflation towards stimulating faltering internal growth. This change in policy stance, along with the lower-reset economic expectations and lower valuations, caused us to gradually upgrade our investment outlook on the emerging world. In this piece we discuss what has changed since our last update in December, the themes we like in these markets, and what conditions we are looking for in order to further increase our exposure to EM equities. What has changed since December? 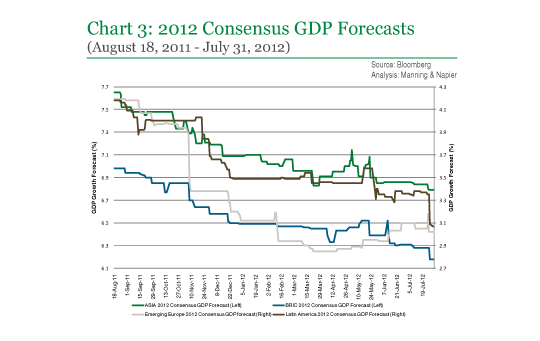 Charts 1, 2, and 3 paint a picture of progression in some key EMs since December 2011. GDP growth and Industrial Production have both weakened in most countries, and near-term growth expectations have continued to march lower. However, while growth is clearly decelerating, the silver lining is that the inflationary pressures seen throughout 2010 and 2011 have moderated in the last year (India being the notable exception). This development has given the EMs the necessary room to reverse monetary policy stances within the last 6-9 months bringing numerous monetary easing measures, as well as a myriad of fiscal policy measures aimed at stabilizing economic growth. 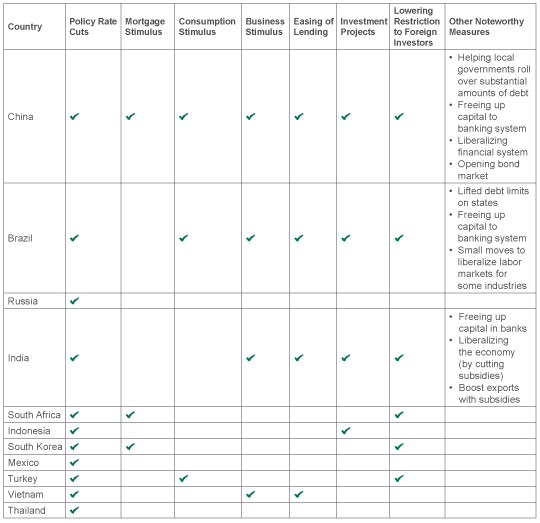 The checklist of policy measures on the previous page highlights that EM policymakers have shifted their focus to growth, and we believe this is an important development. It is well-known that monetary policy acts with long and variable lags, and thus far actions have not yet resulted in an up-tick in growth expectations for the EMs (Chart 3). However, given the very pronounced shift in policy stance in the EMs over the last 6-9 months, we believe that the investment outlook for Emerging Markets is beginning to look brighter. While we pointed out that EMs were historically cheap in our December update, metrics such as price/sales show that many have indeed gotten even cheaper over the last 6-9 months (Chart 4). 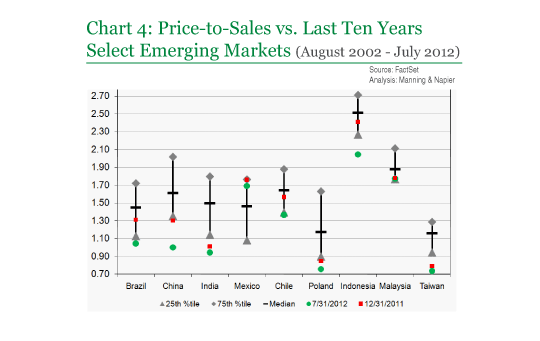 In fact, looking at the EMs relative to their own ten year history on various factors, there are several countries that are today cheaper than almost all of Developed Europe and the U.S. – something that has happened only on very rare occasions in recent years (EM valuations have generally re-rated upward relative to developed markets since the early 2000s). In fact, as can be seen in Chart 5, all four of the constituent BRIC countries (Brazil, Russia, India and China) are now cheaper than the U.S., Canada and the aggregate of the Eurozone. 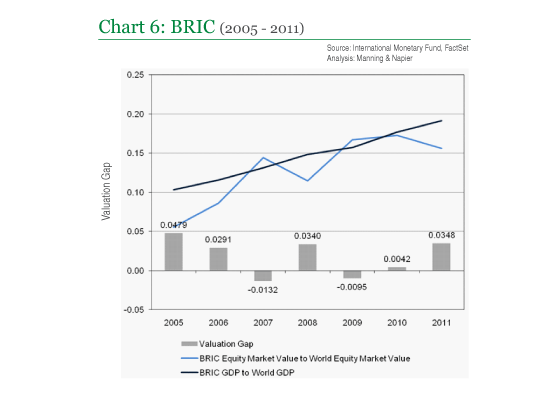 While the BRICs today are contributing more than they ever have to global GDP and have better secular economic growth outlooks than the developed markets, today there is the widest valuation gap between developed markets and the BRICs since 2005 (Chart 6). In short, numerous measures show that today, emerging equities represent a much better valuation entry point than they have in several years. Where is the bottom, and what conditions need to be present for EMs markets to reverse their slump? While the EMs have gained more macroeconomic stability over the last decade, their respective equity markets still possess heightened sensitivity to global economic cycles and are therefore usually higher beta. Due to this phenomenon, EM equities are traditionally prone to overshooting both on the upside and the downside of large inflection moves in economic growth (Chart 7). Therefore it is not surprising that as global economic growth has slowed since late 2010, EM stocks have fallen by around 20%. What is encouraging, however, is that in absolute terms, the MSCI EM index has not seen a new absolute price low since October 2011. This could be an indicator that while growth is still decelerating in the EMs, this is already well-known by the market and the low level of valuation is beginning to offer support. Having said that, it should be acknowledged that for several years our view has been that global growth is likely to be sub-par given still high debt levels in the developed world, and the need for several large economic regions (U.S., U.K., Europe, Japan) to go through a process of de-leveraging of their private and public balance sheets. This means that EMs would have to rebalance toward being driven by internal demand, a process that would likely take several years and could go through several speed bumps before coming to fruition. High inflationary pressures were one of the speed bumps that the EMs faced last year, and as a by-product of dealing with those challenges, this year’s worries are about the pace and sustainability of EM growth. 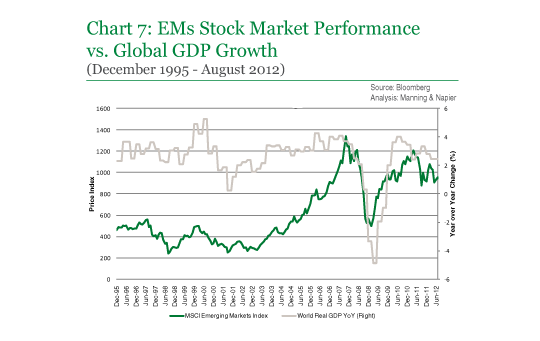 In that sense, it should be acknowledged that while October 2011 may have been the bottom for EM stock prices, as seen numerous times during previous episodes, the EM equity markets are not likely to make a pronounced upward move until global economic momentum starts to show definite signs of re-acceleration. While we are perhaps not yet at the cusp of accelerating global growth, we do believe that there are substantial long-term opportunities in the EMs, and today those opportunities come at attractive valuations. 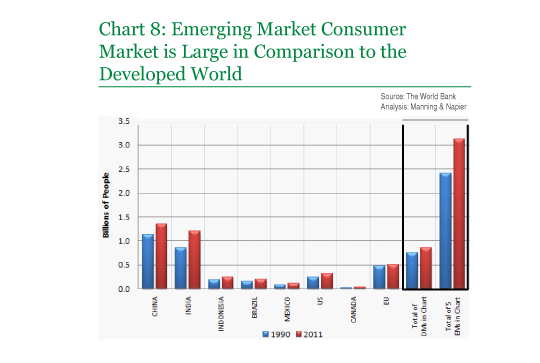 As mentioned previously, the EM consumer market is large, and there is a fast growing middle class that is seeing stronger economic prospects in front of it than ever before. The number of people in the emerging world receiving their tertiary education is set to increase substantially in the next few decades, and the sheer size of the population itself leaves room for immense consumption opportunities (Chart 8). The need for more investment in high quality infrastructure, technology and medical services is immense. 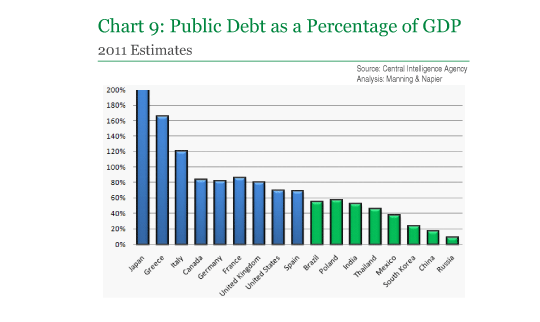 The EMs also have better fiscal dynamics, as evidenced by lower public debt as a percentage of GDP compared to most developed markets (Chart 9). Therefore, building on our recommendation to “dip a toe in” EMs in December, we believe that it makes sense to continue increasing exposure to the most attractive long-term stories exposed to the growth of the emerging consumer: service industries, greater demand for healthcare, and the need for better infrastructure and technology investments. While all of the factors listed above give EM economies secular growth potential, it should be noted that the very high pace of real growth seen in the early 2000s came after a period of significant restructuring and economic reforms instituted after numerous EM economic crises throughout the 1980s and 1990s (Latin American debt crisis of the late 1980s, Indian economic reform program of 1991, Mexican Tequila Crisis, Asian Financial Crisis, Brazilian Real plan of 1999, Chinese SOE reforms 2001-2004, etc.). The numerous reforms the emerging countries undertook during times of crisis helped them experience strong economic recoveries in the decade following their implementation. As they rebuilt their economies, these countries introduced supply-side reforms, and were able to pick relatively low-hanging fruit and add significant amounts of productivity, efficiency and vigor to their economies. The speed bumps seen by EM countries in the last few years, specifically in regard to re-emergence of serious inflationary pressures and lower pace of growth, imply that these developing countries once again need to accelerate the pace of reforms that would make their economies more dynamic, faster growing and less dependent on Western demand growth, which is struggling today. 7) Further develop their own financial markets so that they are less dependent on Western financial flows. The EM countries that accelerate these steps have a much greater chance of realizing higher economic growth and creating lasting wealth, while those that do not pursue them (or worse, go counter, such as Argentina) are more likely to keep hitting serious roadblocks and much lower sustainable growth. We will continue to monitor the environmental risk profiles of the EM countries for signs that real and meaningful policy changes are taking place. A notable economic slowdown in many emerging markets has materialized over the last year, resulting in significantly lower growth expectations and more attractive valuation metrics. The EMs have made significant policy easing moves in recent months and are likely to do more in the next few months, and therefore we perceive that the economic and investment outlook for these countries is likely to begin improving; barring any external shocks to growth. Today, many of the world’s developing countries are in a better fiscal position relative to their developed market counterparts, and we believe the long-term secular themes are still intact. 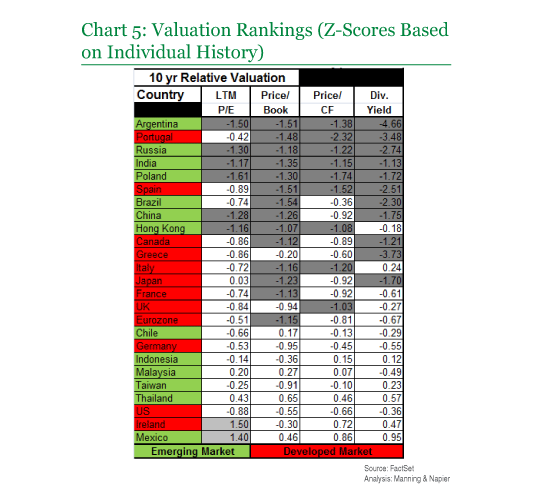 With EM valuations now even more attractive than they were in December, we continue to see opportunities to accumulate EM companies exposed to favorable trends and themes, although we feel that some countries are in much better shape than others based on many of the indicators we monitor in order to assess each country’s risk profile. Official statements of need and intent to continue with reforms to pensions and healthcare, to encourage switch to a more consumption led economy. Announced the launch of a $35 billion wave of public sector investment. Raised limits on the maximum amount foreign investors can invest in government bond market. Analysis: Manning & Napier Advisors, LLC (Manning & Napier). Manning & Napier is governed under the Securities and Exchange Commission as an Investment Advisor under the Investment Advisers Act of 1940. All investments contain risk and may lose value. This material contains the opinions of Manning & Napier Advisors, LLC, which are subject to change based on evolving market and economic conditions. This material has been distributed for informational purposes only and should not be considered as investment advice or a recommendation of any particular security, strategy or investment product. Information contained herein has been obtained from sources believed to be reliable, but not guaranteed. This newsletter may contain factual business information concerning Manning & Napier, Inc. and is not intended for the use of investors or potential investors in Manning & Napier, Inc. It is not an offer to sell securities and it is not soliciting an offer to buy any securities of Manning & Napier, Inc.